CE-Qual-W2 Temperature Modeling USACE, Portland District (OR) | WEST Consultants, Inc.
WEST Consultants was tasked by the U.S. Army Corps of Engineers (Corps), Portland District, to investigate impacts to downstream temperatures due to releases from nine reservoirs in the middle reaches of the Willamette River. The Oregon Department of Environmental Quality (DEQ) is currently developing a CE-QUAL-W2 model of the Willamette River and its main tributaries in order to produce temperature Total Maximum Daily Loads (TMDLs). WEST used CE-QUAL-W2 to develop temperature models of Hill Creek Reservoir; Lookout Point/Dexter Reservoirs; and Green Peter/Foster reservoirs. Later, we developed temperature models of Dorena, Cottage Grove, Fall Creek, and Fern Ridge Reservoirs. Each model was calibrated and validated to observations and then run for 30-35 years to simulate the historic range of flows and atmospheric conditions. 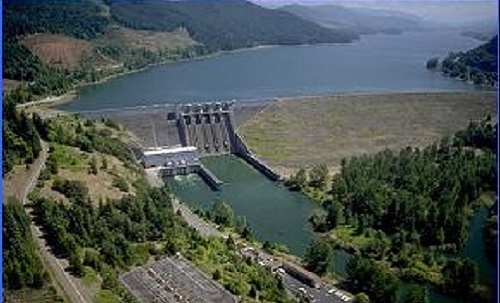 WEST also completed the development of temperature models for the four Corps reservoirs on the lower Columbia River from Bonneville to McNary. WEST worked with Version 3.7 of CE-QUAL-W2 to model several methods to blend the withdrawals from a reservoir to meet downstream, in-stream temperature targets for fish habitat. The study estimated the change in temperatures released from Hills Creek reservoir, as influenced by tributaries and inflow temperatures to Lookout Point Reservoir. In addition, we evaluated a number of blending strategies including (1) blending from two existing outlets, (2) release from a single elevation of a multi-port tower, and (3) blending releases from two elevations of a multi-port tower.